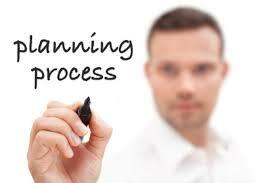 In this article we will discuss about Planning process and various steps of planning process. Planning Process and Steps involved in it. All organisations whether it is government, private or small business but it required process of planning. For achievement of goal they decide what,how and when to do they do planning.Also study that why planning is required in an organisations. * Setting up of the objectives. * Listing the various alternatives for achieving the objectives. Setting up of the Objectives – In planning, the manager begin with the setting up of objectives because all the policies, procedures, methods are framed for achievement of organisational objectives only. Developing Premises – Premises refers to making assumptions regarding future and it is based on plans which are made for achievement of organisational goal. Listing the various alternatives for achieving the objectives – After setting up of objectives the manager make list of alternatives through which organisational goals achieved and there are several ways to achieving objectives and manager must know all the way to reach the objectives. Evaluation of different alternatives – After listing various alternatives, the manager of the company starts evaluating each and every alternative and notes down its positive and negative aspects. Selecting an Alternative – In business process , after evaluation of different alternatives the manager has to select one best alternative, which is beneficial for organisation and help them to achieve their goals. Implement the Plan – After selecting an alternative, the manager has to implement the plan and start its working. The manager start communication the plan with employees because employees have to carry activities according to plan. Follow-up – Planning is a continuous process the managers job does not get over putting plan into action. After implementing plan the the manager as well as employees of the company can follow it. At last we can say that , Planning is necessary to an organisations and it helps them that how effectively they reach to organisational goal. So we have studied Planning process and various steps of planning process. If you have any queries , please let us know in the comments section. 7 Main Nature and Features of Planning in Business8 steps in the planning process8 steps planning processadvantages & disadvantages of planning process pdf free download notes for b.comCharacteristics of Planning - Management Studyclass 12th business studies notesconcept of planning in managementdefine planning premisesdefinition of planningDefinition of Planning And its Features ~ Management Study Onlineexplain planning processExplain the steps involved in the planning process - CBSE Class 12explain the various steps involved in planning processFeatures of Planning - 6 planning features in business and marketingfeatures of planning in managementhuman resource planning stepsimportance of planning pptmeaning of planning in managementplanning process and decision makingplanning process and stepsplanning process and typesplanning process benefitsplanning process business managementplanning process definitionplanning process diagramplanning process in indiaplanning process in managementplanning process in management pdfplanning process in management pptplanning process notes for 12th class students ppt pdfplanning process slideshareplanning process stepsPlanning- Definition and it's features – MBAprinciples of planning in management pdfstages of production planning and controlState any four features of planning - CBSE Class 12 Business Studiessteps in planning in principles of managementsteps in planning process in managementsteps in planning process with examplesstrategic management ppt slides mba studentsThe Basic Steps in the Management Planning ProcessThe various steps involved in planning process are as followsWhat are the Steps Involved in Planning Processwhy planning is necessary to organisation.